You can paint with Spectra® Deluxe Art Tissue. Wet with a brush and wash beautiful translucent color onto the paper. Overlap two colors and watch them blend, or add glue to the water to hold specific shapes in place while you create magnificent, multilayered effects. This high-quality tissue can withstand cutting, crinkling and folding without tearing. Recycled. 100 assorted sheets: 5 each of 20 colors. Sheets are 20" x 30". 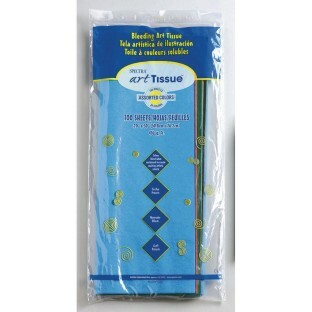 The tissue paper it something that will be used for many different things in our art sections.